"A Gem in the Welsh Countryside". The perfect place to relax with stunning views, a cosy wood burner just 20 min drive from Cardiff. A new Barn conversion set in a large paddock with unrestricted views over open countryside to the Bristol Channel in the distance and North Devon coastline and hills beyond. "The Gallop's" is situated along a country lane where the only traffic is likely to be the racehorses on their daily exercise from the adjacent racing stables, yet has easy access to major roads. The open plan ground floor includes a kitchen, dining and living area with a wood burner and full central heating a separate utility room and separate toilet. The first floor has a Double bedroom with ensuit /shower and access to outside glass balcony, the second bedroom has twin beds and access to its own glass balcony, from both you can enjoy the quite of the countryside and spectacular views. The third smaller bedroom has a single bed and a bunk bed suitable for children under 12 and the main bathroom has a shower over the bath. There is secure storage for bikes or sporting equipment. Children and dog friendly. The picturesque village of Llancarfan and the Fox and Hounds Pub is one and a half miles away, the delightful market town of Cowbridge is 10 minutes drive, with many fashion and gourmet food shops line the High Street, and there are all types of cafes, pubs and restaurants to choose from. Cardiff International Airport is 10 minutes away, Barry and Barry Island with its fun fair, amusements and beach is a 15 minute drive. Llantwit Major is the site of ST Iltydds which was the site of one of the first christian churches in the British Isles and probably the start of early Christianity in Wales is also 15 minutes away. The beautiful beaches at Southern Down & Llantwit Major and popular with surfers and Ogmore-by-Sea has lovely sandy stretches and not far away the Porthcawl beach and fun fair. Swansea and the Mumbles are less than an hours drive. The Heritage coast line is close by with wonderful walks along the cliffs from Penarth down towards Porthcawl. Cardiff is 10 miles away, an easy 20 minute drive with its famous Castle, Victorian Shopping Arcades, Markets and Civic Centre, including the University and The National Museum and Art Gallery. Cardiff Bay is linked by a footpath to the Barrage, Norwegian Church and Pier Head which is buzzing with restaurants and cafes and The Doctor Who Experience! We live in Llanbethery which us a couple of minutes away from the barn so always on hand if needed. We love the countryside and area we live in. We both work locally and have 2 children and daughter aged 21 and a son of 17. We have spent a year converting the 200 year old barn taking a lot of care and attention to detail creating a property that we love and I know you will too. Amazing views. Wood burner We care for the environment, the electricity is supplied by Solar and the water is from a Bore hole. 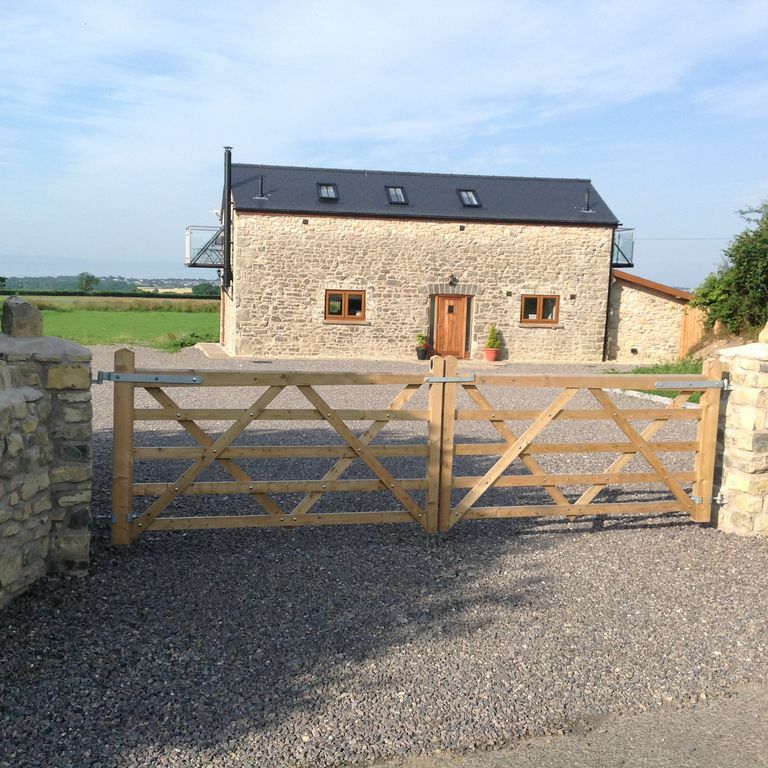 The Gallops is one of the best holiday rentals we have ever stayed in. The setting was idyllic with lovely views towards the sea and a sunny and very large back lawn which our grandson enjoyed playing in. It was also brilliant for our early Easter egg hunt. The accommodation was immaculate and very well equipped. We were four adults, one six year old and two babies and we found the accommodation served us well. Lots of storage and good sized bedrooms. The balconies were a bonus and added to the enjoyment of the property. It was lovely to have two bathrooms, a downstairs cloakroom plus a utility room. A home from home. Another joy was seeing the lovely racehorses on their daily exercise which my six year old grandson plus the adults all found fascinating to watch. Jane and Les the owners are very friendly and helpful and offered advice whenever needed. We enjoyed a wonderful four night stay and would not hesitate to return as it is a stunning area of Wales with easy access to beaches, countryside pursuits and the city of Cardiff all within an easy drive. We could not fault it. Jane and Les were very helpful and friendly. Beautiful property, couldn't have asked for more. The cottage was immaculately clean, warm, comfortable, peaceful and has everything you could need. Jane made us feel so welcome when we arrived. The garden was huge and perfectly safe and secure for our dog to have the best time watching the horses go by. We had a lovely stay, it's perfectly situated for lots of long beach walks, great pub dinners and then back for a cosy evening in front of the woodburner, cant wait to go back. Thank you for your review it was a pleasure to have you to stay and glad you enjoyed the property and area. Look forward to welcoming you back in the future. We had a lovely stay at the gallops. The house was well equipped with everything you might need including high chair, travel cot and children’s toys and games. The log fire made the house lovely and cosey when the wind was howling. The location is great and is ideally placed to visit much that South Wales as to offer. The property was beautiful with everything provided. The owner Jane had also left some basic groceries for us to make our stay easier. The views are lovely and there are lots of places to visit locally as well as being so close to Cardiff. Thabk you for your review, glad you enjoyed your stay, it was a pleasure to have you. Wonderful property. Made to feel very welcome. Great facilities, warm, clean and comfortable. Will definitely be visiting again. Thank you for taking the time to write a review, glad you enjoyed your stay it was a pleasure to have you. Hope to see you again at some time in the future . The Vale of Glamorgan, often referred to as The Vale, (Welsh: Bro Morgannwg [ˈbroː mɔrˈɡanʊɡ]) is a county borough in Wales. With an economy based largely on agriculture and chemicals, it is the southernmost unitary authority in Wales. Attractions include Barry Island Pleasure Park (known for the BBC sitcom, Gavin & Stacey), the Barry Tourist Railway, Porthkerry Park, St Donat's Castle, Cosmeston Lakes Country Park and Cosmeston Medieval Village. It is also the location of Atlantic College, one of the United World Colleges. St Fagans is one of Europe's leading open air museums and Wales's most popular heritage attraction and admission is free! From rugged coastlines, rolling countryside and beautiful gardens, the Vale of Glamorgan has great attractions for you to visit. •• Southerndown Golf Club Southerndown is a hidden gem, unique in offering part sandy links and part acid-heathland, and due to its terrain it is one of the driest courses to be found throughout the land.